Graffiti becomes a regular sight when living in the urban core of a major city. The illegible “words” scrawled across the most unusual of places within the urban fabric might be dismissed by some, might be praised my others, and might be criticised by the other few. However what most people don’t know is that these interventions represent a conversation at the scale of the city – a conversation that is invisible to the outside eye, but at the same time, begs for attention. 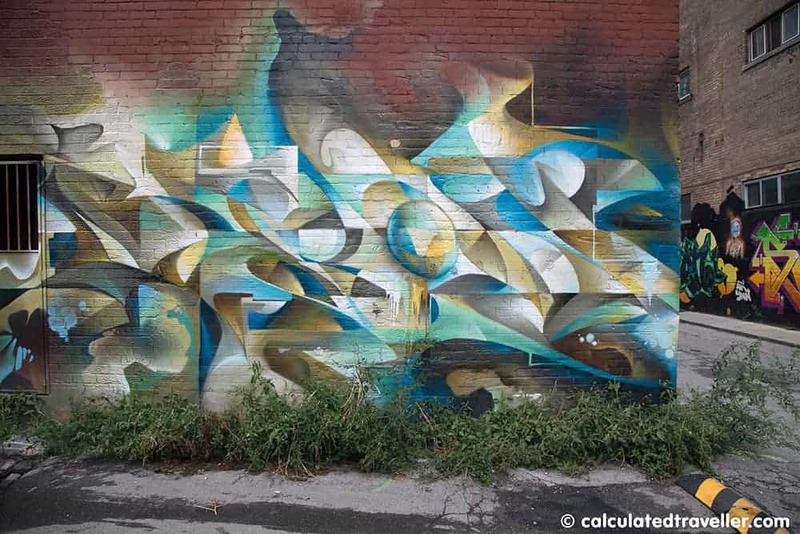 This past September I met Kit – an actor, rapper, writer, and former graffiti artist under the name, “Knows” – who leads a graffiti tour with Tour Guys Toronto. He provided the most memorable insight into the world of graffiti in downtown Toronto, which has changed how I look at graffiti around the city. As many of you might know, graffiti artists have “tags” – essentially, their signature that they place on the wall. Almost always, this comes in the form of words, in the form of a name. It’s an identity that one recognises but doesn’t actually know. Take Banksy for example – the infamous graffiti artist plasters his detailed illustrations commenting on the particular site all around the world; but who is he really? So one begs to question: what’s the point? Kit explained that it’s an impulse to own part of the city within the noise. It’s the experience of knowing. And what I found truly interesting was that graffiti becomes a conversation between these artists: layers of visual commentary on a particular stylistic identity that cover the city’s infrastructure – often the forgotten spaces. And there’s a full vocabulary that comes with this conversation. Tags, throws, pieces, burns, toys – all of these are messages to the previous artist, often plastered atop what one had left behind. Might be bad. Might be good. Might be funny. Either way, it’s a conversation worth deciphering. You’ll notice pieces like the stencilled grenade above – found in an alleyway just off of Spadina and Queen West – that was put up on top of someone else’s work. In plain English, another artist called him out – “STAY OFF REAL GRAF”. A warning? A message? A political root? A hidden conversation that has been stemming across other pieces in the history of this particular graffiti artist? What you will see is the layers of history – an almost urban archaeology that requires study. So check out some of my favourite graffiti that I saw on my tour with Kit. Look around; look up when you’re walking downtown. Even take a look out of your window at home or the office – check out the oddest spaces that graffiti might be. Ask yourself, why? How did they do this without getting caught? Was it commissioned? What impact did that have? The more you stare – or squint to make out the forms – the more this art becomes connected in your mind to various masked artists around the city. Engage with the art as a conversation, and try to decipher the messages layered upon one another. 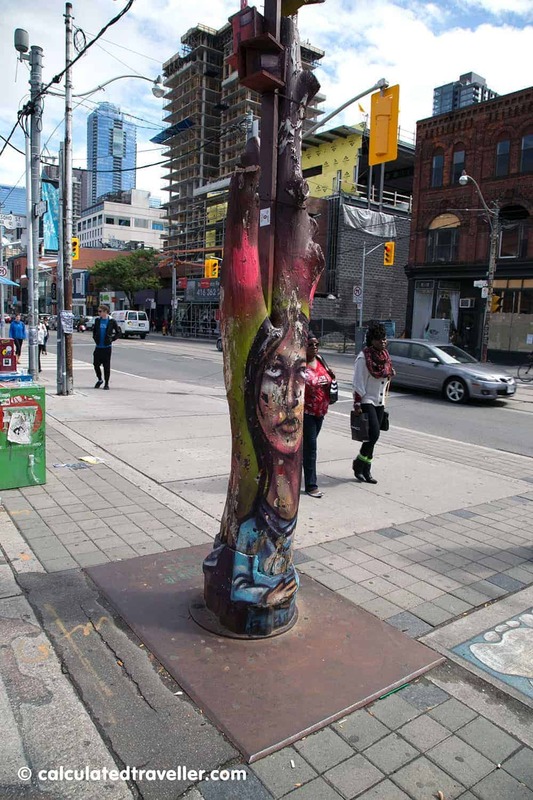 The infamous Hug Tree is by a very recognisable graffiti artist in Toronto – whose art often paints shifting expressions of incredibly detailed human faces. He uses spray paint to its fullest capabilities as a medium – blending colours to achieve depth and realism. Interpret the smile (or lack of a smile) as you wish. You might recognise the signature bird in this graffiti. I’ve seen it all across the city on my commute! What’s awesome about Uber is the use of the physical constraints in the urban landscape to better the humour. The image to the right is a commissioned piece that covers the entire building and has been preserved in this resin, right along Graffiti Alley (which runs east-west just south of Queen Street West, near Spadina Ave). This might look only as an abstract pattern, but it’s actually a tag that spells out Bacon. It’s a really recognisable style that draws influence from stained glass – contrasting colours and using hard lines to hide the letters that spell Bacon’s identity. Have you taken a graffiti tour before? Recognise any of these pieces of graffiti? Do you have a favourite piece in your city? This tour was provided courtesy of Tour Guys Toronto, all opinions are my own. Check out their website for other unique tours around the city and around the world. Looking for more street art articles? Jamie Kwan is a Multidisciplinary Architectural Designer and Strategist based in Toronto, Ontario, Canada. While not the biggest adventure-seeker, he will go out of his way to check out and experience the most hidden architectural gems of a city...and find the most awesome grilled cheese sandwich ever. I actually love graffiti when it’s actually art and not just someones signature. If I were to settle into a hip house, I’d actually consider having a wall with graffiti. It’s cool to see these “out-of-the-box” tours happening. Thanks for sharing. I’ve lived in Toronto all my life and often shopped/dined around Queen St West and Spadina Ave but I never knew a graffiti alley existed. I am going to have to check it out after seeing these great photos. Looks like an awesome tour – and one I’d love to do on my next visit to Toronto. That Hug Tree is certainly unique. Wow there are some really cool pieces here. Love the Hug Tree. I remember seeing a lot of cool street art when I was in Montreal last year. Montreal’s a great place for public art, as well as graffiti! I’ve been meaning to go back – I was just in Quebec City and they had huge art installations (Nuit Blanche-esque) set up in the old portion, so it was a great atmosphere for both history and contemporary art. That one with the feet in the air is so cool! I didn’t even know there was a such thing as a graffiti tour, but it seems like a lot of fun!